If you have a strong stomach, picture this scene. You are on top of England's highest mountain, Scafell Pike, marvelling at the beauty of the Cumbrian fells, when you realise you need the toilet. But there are no toilets. There are no litter bins either. The possible next step is what resulted in this comment from the Wasdale Mountain Rescue team on their Facebook page: "Shocking amounts of litter, people creating new paths, the stink of urine and worse on the summit of Scafell Pike this morning". People replied that it was "utterly irresponsible", "absolutely shocking" and a "disgrace" that "ignorant people" were "ruining" the countryside. 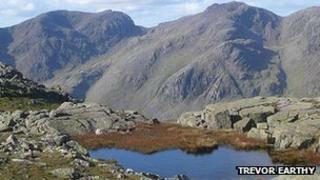 Adam Naylor, manager at the Wasdale Head Inn, which is nestled at the bottom of the pike, said guests had been returning from Scafell Pike "saying how disgusting it is". "If the rural communities went to London, Manchester etc... and dumped loads of rubbish, pooed in the shop doorways and peed on the main street we would be locked up and there would be a national outcry," he claimed. Nick Owen, from Langdale Mountain Rescue, said litter and human waste had been a problem "for a good few years". The problem is that, at higher altitudes, organic matter does not rot as quickly as even the most conscientious walker might expect. Paul Foster, a regular walker, said that in the 1980s and 90s banana skins and orange peel were a particular problem. But he thinks attending to the call of nature is not always unacceptable, if done with care. "People are generally quite discrete when they excrete and, as long as everyone doesn't go in the same place, this isn't usually a problem in terms of decomposition," he said. "If their poo, and especially their paper, is covered with a stone away from the path, then this shouldn't be noticed and will rot-down in time. "As long as everyone doesn't choose to wee in the same place this is not an issue at all, as long as it's done with discretion." In the summer, traffic up Scafell Pike is increased by the Three Peaks Challenge, which sees thousands of people attempting to scale it along with Ben Nevis in Scotland and Snowdon in Wales within 24 hours. Critics claim some - those who are not regular walkers - have less respect for the fells. "They're not steeped in the culture of this notion of 'leave only footprints, take only photographs'," said Mr Owen. "It's so remote and it takes place in the dark, this particular section of the three peaks, and they seem to think they can kind of get away with it." Paul Vickerage, responding to Wasdale Mountain Rescue's comment, agreed, saying: "Only in darkness could you poo on or near the paths. "They are only interested in going up and down in the fastest time and carrying a little as possible, so taking time to scoop or pick up litter is out of the question." However, there is widespread praise for those events which are well organised by groups who bring their own marshals and toilets and take away litter. Clive Stretton, from the National Trust, which owns and cares for the mountain, says rangering teams and volunteers with the Fix The Fells scheme periodically go up and clear litter. But he said providing any facilities at the summit was not an option. "I think it would be a dangerous route to go down because of the natural environment," he said. "The very reason people go up into that arena is to get away from signage and man-made infrastructure." There are toilets and bins at the bottom, next to the village green in Wasdale, which Mr Naylor said were "overrun" during peak season and closed at night when many "three peakers" arrive. The Lake District National Park Authority said it had been working to find a solution to the problem since opening these portable toilets - intended to be a temporary measure - in 2010.